I was supposed to have my ceremony outside here with the reception inside. When I booked it I was told that there was a back up room available in case of poor weather. This was not hard to believe since the venue is very large with several different rooms. Later that year all of a sudden this was not the case because the rooms had all been leased out. I was not told this could happen. Of course it ended up raining on my wedding day and I had to flip the reception room and use it for both the ceremony and reception. Worse than that though was that it is always under construction, which I was not made aware of when booking the venue. Darla, the property manager, was not concerned with the construction on my wedding day and made me feel weird for being concerned myself. I was pretty disappointed in the venue. I would not book here if I where you. 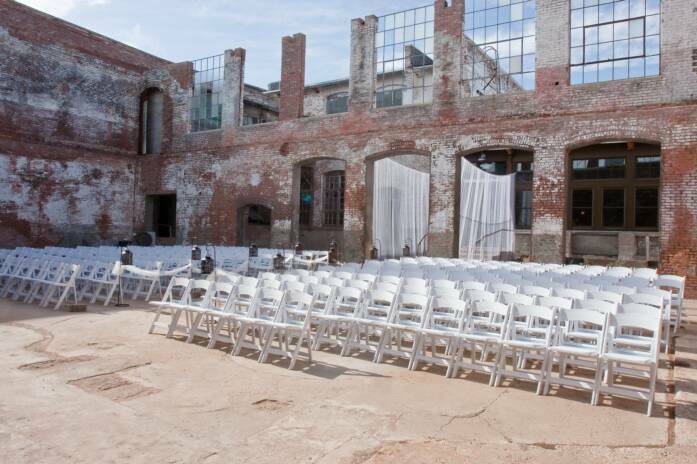 I fell in love with this reception hall when I booked it for my wedding, but TRUST ME, do not be fooled! The property manager Darla, was not easy to work with, and I even had a coordinator who said she was so difficult. They do not care if there is construction visible during your wedding, and THERE WILL BE because it is awlays under contruction. This was not told to me though. I know now that they have a contruction clause in the contract, which was not there until I began complaining. On the day of my wedding the entire front of the venue (which was so pretty before) was covered in bright orange contruction tape and fencing.